Mexico City is the capital of Mexico as well as the largest city, population wise, in all of North America. This teeming metropolis is enormous, and it is divided into more than 1,700 different neighborhoods. The historic downtown is packed with historic landmarks, and there is no shortage of world-class museums to choose from. While you could spend days exploring Mexico City without getting bored, don’t miss out on the chance to discover the region. 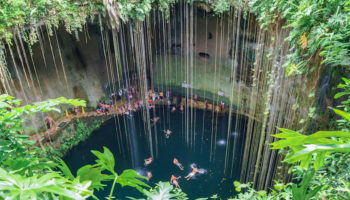 Day trips from Mexico City can allow you to see ancient ruins, remarkable scenery and plenty of culture, so be sure to include some of these destinations in your travel plans. Drive two hours southwest of Mexico City, and you’ll approach Malinalco. This destination is worlds away from the hustle and bustle of the capital, and during the week the colonial town can be very quiet. 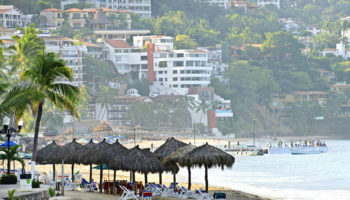 The main reason to visit is the dramatic landscapes, the beautiful cliffs and the ancient Aztec ruins. You can still tour the ruins of Malinalco, which are set into a mountain overlooking the small town. Thanks to a handful of international restaurants and a few quirky boutique shops, it is easy to make a full day of this charming destination. While it is just about possible to visit Malinalco by public transport, direct buses only depart Mexico City very infrequently, so you’re better off first taking a bus to nearby Chalma. From Terminal Poniente in Mexico City, it takes around two and a half to three hours to reach Chalma. Once you arrive, you can either take a 15-minute bus or taxi to Malinalco. As it is a bit time consuming and complicated to get there by public transport, many people decide to take the car to Malinalco instead. The quickest route takes about two hours, although this does involve a toll road. Head southwest out of the city center on Avenida Chapultepec, which eventually turns into Federal Highway 134D. At La Marquesa, turn off onto the 6 and head south to San Pedro Techuchulco, where you then follow Avenida Tepexozuca until the foot of Tezontle Volcano. Here you should see signs pointing you to Malinalco. 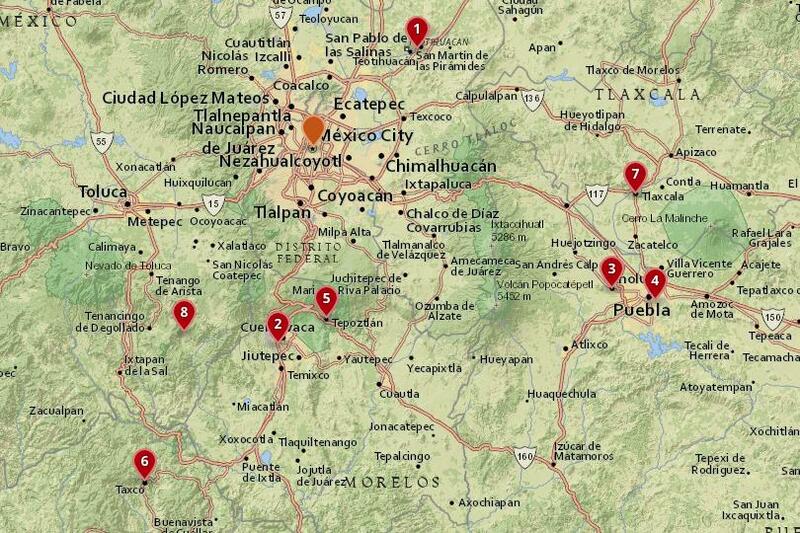 The drive takes you past some spectacular volcanos, and once in Malinalco, everything is within walking distance. Tlaxcala is both a state and a city, and it should definitely be one of your top choices for a Mexico City day trip. The city of Tlaxcala is home to the breathtaking Palacio de Gobierno de Tlaxcala as well as a range of colonial buildings that have been carefully restored, such as the Basilica of Ocotlán. With a large student population, good restaurants and bars and a handful of excellent museums, the city has a surprisingly vibrant cultural life. Outside of the city, you can see bright and colorful Mayan frescoes that are part of the Cacaxtla archeological ruins, or you could head to the ruins of Xochitecatl, which are home to ancient pyramids. By public transport, the city of Tlaxcala is around a two-hour journey away, and regular buses depart from Terminal Oriente in Mexico City. On the way, you’ll pass through some incredible mountain scenery. Once you arrive in the city, all the main sights are within walking distance. If you want to visit the nearby archaeological ruins of Xochitecatl, you’ll need to hop on another bus, but as it is quite time consuming, it may be better just to take a taxi. From the center of Mexico City, it is straightforward to get to Tlaxcala; simply follow Federal Highway 150D east for most of the journey. It is only once you reach San Martin Texmelucan de Labastida that you turn off onto the 117; this will take you to the city of Tlaxcala. While you’re in the area, it is well worth driving to the nearby ruins of Xochitecatl or Cacaxtla. Both sites are sure to impress. Another option for visiting Tlaxcala is to take a guided tour from Mexico City. As well as exploring the fascinating historical and architectural sites in the city center of Tlaxcala, tours also take you to see the amazing ruins at Cacaxtla, and your guide will tell you all about the interesting sights you come across. 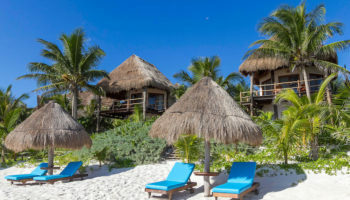 See trip reviews & prices. South of Mexico City is Taxco, a stunning colonial city built into a hillside. Known for its mining industry, Taxco is the ultimate place to shop for silver souvenirs. There is even a silver museum in the Casa Borda where you can admire a dazzling collection of silver artifacts from the past two centuries. You can’t miss the Santa Prisca Cathedral, a beautiful baroque building from the late 18th century. As you stroll along the narrow cobblestone streets, look for vendors selling the local dish called Pozole. White Pozole is served daily, but Thursdays are special days where the traditional red and green Pozole is offered. While Taxco is around three hours away by bus, the journey is very scenic, so the time should fly by. Buses run regularly from Terminal de Autobuses del Sur in Mexico City. As the main bus station in Taxco is located in the city center, you’ll find all the main sights are just a short walk away once you arrive. By car, the journey should take around two and a half hours if you want to take the toll road which is quicker. Head south out of the city center on Calz. de Tlalpan, then hop on Federal Highway 95D heading towards Cuernavaca. Keep on it past the city, and it will take you past some wonderful countryside, directly to Taxco. If you are pressed for time you may want to consider taking a guided tour to both Taxco and Cuernavaca. With a professional guide on hand, you’ll get to visit all the main sights in both cities. You’ll come away with a deeper understanding and appreciation for the country’s rich history and cultural heritage. See trip reviews & prices. Tepoztlan is a new age destination with a unique vibe and some fantastic ruins. A short hike of under an hour will take you to the top of a mountain known for its positive energy, which is where you’ll also find the ancient pyramid of El Tepozteco. Back in the town, be sure to check out the beautifully restored convent known as Dominico de la Navidad. While in Tepotzlan, try out some of the progressive holistic rituals and pastimes like Temazcal, a kind of ancient sweat lodge, or yoga. Located right next to Cuernavaca to the south of Mexico City, Tepoztlan takes around an hour and fifteen minutes to reach by public transport. On the way, you’ll pass some spectacular mountains. Just hop on a bus at Terminal de Autobuses del Sur and sit back and enjoy the ride. Once you arrive, it is only a short taxi ride to any of the main sights. By car is just as easy and the journey takes around the same time, depending on where you start off in Mexico City. Simply head south on Calz. de Tlalpan and follow it until you see signs for Federal Highway 95D, which heads towards Cuernavaca. 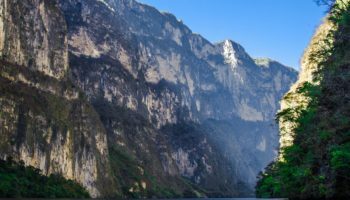 Simply stick on it until you see the signs to Tepoztlan. After exploring Tepoztlan to your heart’s content, you can head to nearby Cuernavaca to explore yet another of Mexico’s fabulous cities. Puebla is east of Mexico City, and it is a city known for its history, cuisine and landscape. Puebla is situated within a valley, and it is surrounded by snow-capped mountains. In the 19th century, The city was the site of battles with the French, and two remaining forts from that time period are major attractions and points of pride for local residents. After sightseeing and touring the Zocalo plaza, the 16th century Puebla Cathedral and the art district of Los Sapos, dig into some of the traditional cuisine. A few local specialties include fresh fried potato chips with lime juice, cemitas and chorizo filled quesadillas. Getting to Puebla by public transport from Mexico City is very easy; buses depart around every 15 minutes from Terminal Oriente. The journey takes about two hours if there’s no traffic, and you pass by some lovely scenery. Traveling around the city center in Puebla is a bit more complicated as all transport is privatized. As such, there are loads of different bus routes weaving their way around. Consequently, it may be easier to take a short taxi ride to whichever site you want to visit first. From Mexico City, Puebla is around a two-hour drive away, and the route couldn’t be easier. Simply hop on Federal Highway 150D that starts just outside of the city center and follow it to Puebla. Going by car also means that you can check out the fantastic sights at Cholula, which lies just a 15-minute drive away from Puebla. Yet another option is to take a guided tour from Mexico City to Puebla. As well as taking you around the marvelous historical and religious buildings in the center of Puebla, tours also include a trip to Cholula to see the largest pyramid in the world. 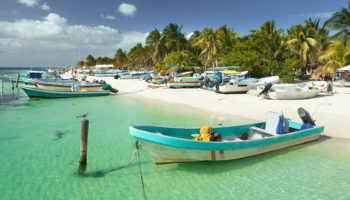 See trip reviews & prices. Just outside of Puebla is another destination you won’t want to miss: Cholula. This small city is home to the world’s largest monument, which also happens to the largest pyramid in the world. The enormous earthen pyramid called Pirámide Tepanapa was built by the Tlachihualtepetl people. In the 16th century, a Catholic cathedral was built at the top of the pyramid, and it still stands. You can tour the cathedral, which is decorated with 24-carat gold. The overgrown pyramid itself has been badly neglected over the centuries and is virtually unrecognizable as a human-made structure but you can access some of the tunnels underneath the pyramid. You’ll also want to check out the small museum nearby, which is home to a number fascinating artifacts and exhibits about what life in Cholula was like in centuries past. To get to Cholula by public transport, you’re first going to have to take a bus to the nearby city of Puebla. The most frequent buses depart from Terminal Oriente in Mexico City; these take around two hours (depending on traffic) to arrive at Centro de Autobuses Puebla. From here, you can either take a 40-minute bus ride or a 20-minute express bus to Cholula, where you’ll find all the main sights within walking distance of the bus stop. By car, it takes around two hours if the traffic is good. On the way, you’ll pass the imposing Iztaccihuatl Volcano. From the center of town, head east on Federal Highway 150D and this will take you most of the way there. Turn off at San Martin Texmelucan de Labastida onto the 190, and this takes you directly to Cholula. Before driving back to the capital, you can visit the delightful city of Puebla right next door. If you don’t want to faff around driving or taking public transport, then lots of tours run daily to both Cholula and Puebla from Mexico City. As they are so near to each other, it is very easy to see both cities in one day. A guided tour will help you make the most of your time exploring their amazing sights. See trip reviews & prices. Only an hour south of Mexico City is Cuernavaca, also known as The City of Eternal Spring. It gets that nickname thanks to the mild climate, which makes it the ideal place to visit and explore outdoors no matter what the season. Cuernavaca boasts plenty of gorgeous gardens and public parks as well as natural thermal springs and rivers. The Teopanzolco Archaeological Site is an Aztec influenced site that is likely 700 years old, and it is a must-see landmark in the city. 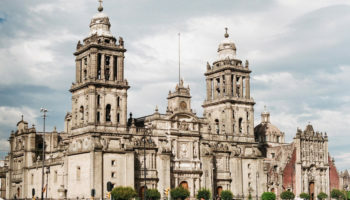 Other important attractions include the 17th century Cathedral and the 16th century Palace of Cortes, which is now home to murals painted by Mexican artist Diego Rivera. Buses to Cuernavaca run very frequently from Mexico City. You can either get one from Terminal de Autobuses del Sur, Terminal de Autobuses del Norte, or Mexico City Airport. From the former, the journey takes around an hour and twenty minutes, while it takes about two hours from the airport. Once you arrive in the city, you can alight at whichever stop is most convenient and hop on another bus if necessary to get to where you want to go. Driving to Cuernavaca from the capital couldn’t be easier; the journey takes just over an hour if the roads are clear. Try to avoid traveling on Friday afternoon or Sunday afternoon as the highway gets very busy during these times. From the center, head south on Calz. de Tlalpan. Follow it for around half an hour until you see signs to Cuernavaca. Turn onto Federal Highway 95D, and it will take you past two lovely national parks, all the way to the neighboring city. Once there, follow signs to the city center. Both Taxco and Tepoztlan are just short drives from the city and are well worth visiting for their lively markets and historical sites. Many people combine a visit to Taxco and Cuernavaca into one day trip, and guided tours are the best way to see what both cities have to offer. With a knowledgeable guide taking you around the cities’ main sights, you’ll learn a lot about the rich history and culture of this part of Mexico. Free time helps you explore the shops and markets at your leisure. See trip reviews & prices. 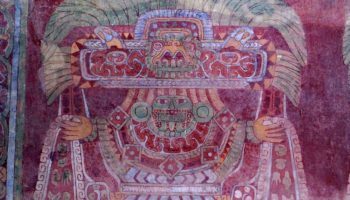 If you’re interested in Mexican history, then there are few day trips more suitable than one to Teotihuacan. This ancient city northeast of Mexico City is home to pyramids that predate Columbian times. Known as the City of the Gods, Teotihuacan is where the gods gathered to create man, according to ancient legend. 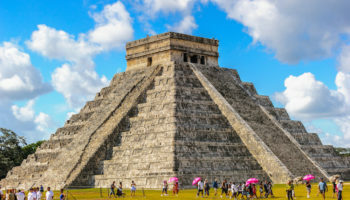 The four major landmarks include the Temple of the Moon, the enormous Temple of the Sun, the Temple of Quetzalcoatl, which is decorated with stone serpent heads, and the Museo Teotihuacán. The museum is home to a complete miniature replica of Teotihuacán, which can help you understand the scale and layout of this incredible destination. To get to Teotihuacan by public transport is quite easy; the journey should take around an hour by bus. From the Autobuses del Norte bus terminal, you just need to buy a ticket, which costs around $3. You can get these at the ‘Piramides’ booth. The bus journey takes you through some lovely scenery, and they run very frequently, although the last bus back is around six in the evening. Once you arrive, you’ll find the spectacular pyramids right before you. By car, it takes around the same time depending on traffic. Head northeast out of the city on Avenida de los Insurgentes Norte. This will take you past the Monumento a los Indios Verdes on your right. After this, it turns into Federal Highway 85D, which you continue along until you turn off onto 132D, which you merely follow until you see signs to the pyramids. There is a small fee for parking. 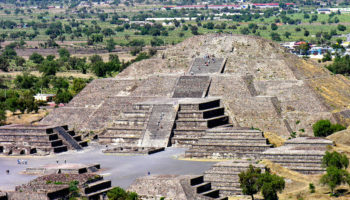 Many people who visit Teotihuacan opt to take a guided tour, as this then enables you to learn all about the history of the incredible edifices from a professional guide. After exploring the site to your heart’s content, the day culminates with a stop at the Shrine of Our Lady of Guadalupe – one of the most visited religious sites in Latin America. See trip reviews & prices.